A dog had to be rescued after getting its head firmly stuck in a wall. 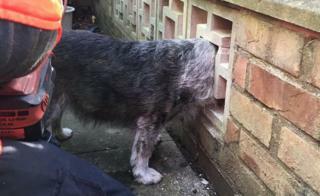 Billy the terrier got in a hole lot of trouble when he decided to peer through a wall in Trumpington near Cambridge. But his head was bigger than he thought and it became stuck in a hole in the trellis-type brickwork. Cambridgeshire Fire and Rescue Service had to be called to the house to rescue the curious dog. He was safely reunited with his owner. Posting photos of Billy on Twitter, they wrote: "Green watch happy to help this poor chap who had his head caught in a wall, not sure he will be investigating the same hole again!"